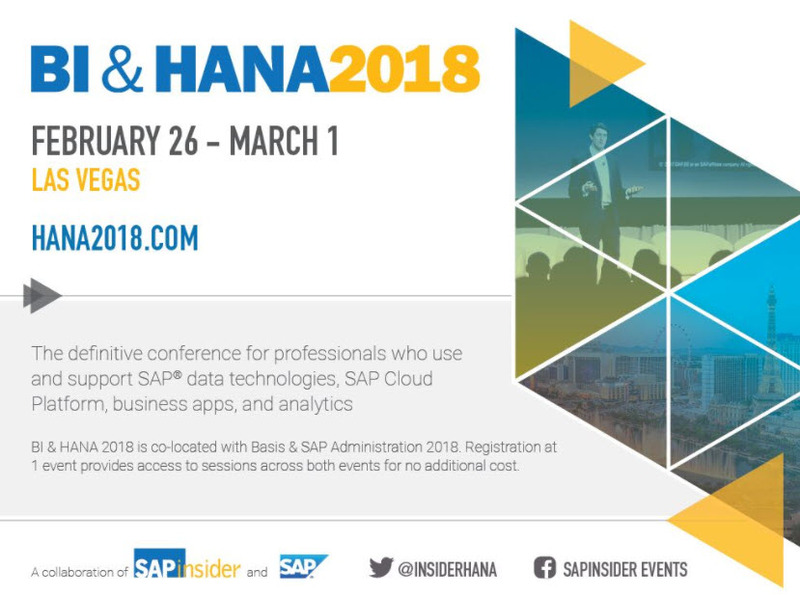 I am looking forward to SAP Insider’s BI 2018 and HANA 2018 conferences taking place February 26-March 1 in Las Vegas. With the super-cold snowy icy weather on the East Coast I am especially looking forward to the warmer Las Vegas weather too. Additionally, I am looking forward to the presentation I am giving, and using the agenda builder to pan out others I will be attending while there. More on my session here. If you’re interested in learning about making the move from BEx to Analysis or hybrid BI, you will not want to miss it. I will be at the Ask the Experts session Tuesday afternoon – this is a great time to sit down informally with SAP experts and others to get your specific questions answered. There will be experts to cover a wide range of BI, BusinessObjects, Admin/Basis, and HANA questions. I have attended these several times, both with questions from myself and it is good to hear other attendee’s questions and listen to the SAP experts’ answer. One year we were there so long they facilities people had to flash the lights so we would leave. I look forward to attending this event every year to catch up with colleagues, keep up to speed with the latest on SAP solutions and SAP’s roadmap, and to get tips for making the most tools I currently use. Find out more about these events at www.BI2018.com, www.HANA2018.com, and also Basis & SAP Administration is running at the same time www.admin2018.com . By registering for any one of these conferences you can access sessions at all three. Need to obtain your boss’s approval? SAP Insider has a “Convince your Boss” letter.